88 Cumnor Hill is a contemporary design of a really high quality building of 6 apartments, which acts as a gateway to an exclusive residential development on an attractive steeply- sloping wooded hillside, on the outskirts of Oxford. The local authority wanted the design to be sympathetic in scale and material to the detached houses along the road. However the houses along the road have no unified style and there was therefore scope for an eye-catching contemporary building. The whole concept of the project hangs around the curved tiled roof which was designed to be of a statement to draw one's curiosity into the rest of the development. Additionally the requirement was that the building needed to be 'set in' the landscape not 'on' the landscape and the palette of materials and design features used, could be reflected in the latter phases. The design is intended to make the most of the slope, make the most of the views, and create a distinctive new built form to suit the use and the site. The curved roof came naturally out of the design process, as a device to reduce the apparent scale of the building, link it to its neighbours, and bring some dynamism to the building. The clay tiles were the perfect material to finish the building: they match the neighbours’ roofs at the same time as managing the curve and creating a striking contemporary look. Given the shape of the roof, the choice of material was immediately limited. 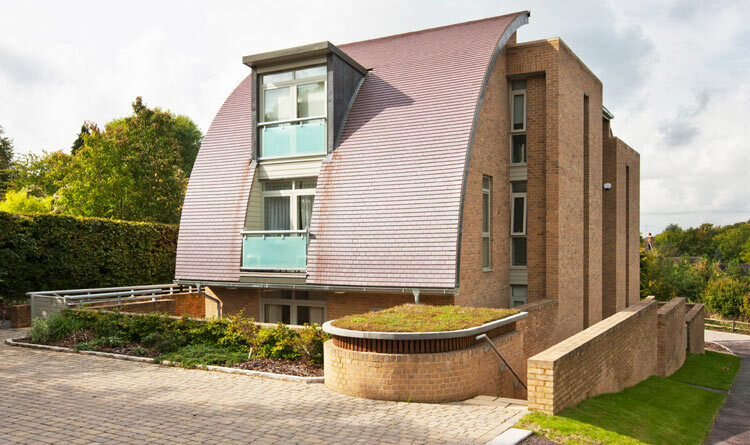 Elsewhere in more urban locations, the architects Adrian James had previously successfully used standing seam metals to clad similar curved roofs: copper, prepatinated copper, stainless steel or zinc. None of those materials was really suitable here, where as the requirement was that the roof needed to be sympathetic to the context. 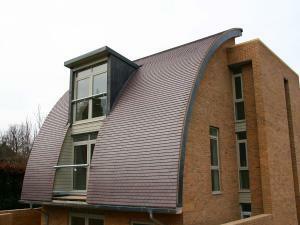 Plain tiles were found to be the best solution, to suit the context and cope with the curves. Different types of tile were considered, but in the end Adrian James selected Staffordshire Blue Dreadnought Tiles because of their strong even and natural colour, which gives the building a crispness well-suited to its contemporary aesthetic. The design of the curved roof is a segment of a circle producing a continuously changing pitch. Because of the height and width of the building to be covered by the tiled roof, the last two metres at the apex fell below a 35 degree pitch. The main challenge was creating a robust design for the sub roof that protects this lower pitch section, without being obvious. Therefore this area of roof was constructed so that the tile covering is decorative below the 35 degrees, but matches the main portion of the working clay tile roof with no distinguishable joint. The problem was that NHBC would not accept the doubling up of the Tyvek membrane for the section below 35 degree pitch at the upper most section of the roof. They were concerned with wind driven rain. For the top portion of the curve, effectively 1800 ­ 2000mm from the ridge an underlay system developed by Grace Ice & Water Shield was used and the construction altered slightly to accommodate it. This underlay is a self adhesive membrane for premium roof protection on sloping timber boards. It was developed for northern USA & Canada, primarily to deal with the formation of ice dams on roofs ­ water backing up behind the ice would find its way through the shingles, through the roof deck and in to the structure. A mock-up of this section of the roof was constructed and subjected to continuous flows of water from a hose to prove the water tightness of the design and the ability of the camber of the tiles to follow the curve dictated by the rafters on battens fixed at a constant and standard 100mm gauge. Standard production tiles achieved this without the need and expense of special heavily cambered mansard tiles. The lower courses of tiling are almost vertical and much of the roof pitch is in excess of 60 degrees, consequently all tiles were twice nailed on the whole roof. Despite this, the consistent shape of the machine made tiles enabled them to lie closely and provide an apparently seamless surface. on 38 x 25 batten over rafters. the external curved walls with 100mm thick insulation in-between the rafters with 25mm thick insulation below the rafters effectively forming the vapour barrier with 2 layers of 6mm thick plasterboard. 1. 38 x 25 counter battens fixed to top of rafters with 2 layers of 12mm thick ply or OSB board fixed on top of the counter battens. 4. with 2 layers of Tyvek breathable membrane and 38 x 25 tile batten with Dreadnought tiles twice nailed on top where the zone ended a timber fillet was fixed to the edge of the ply/OSB and where the Ice & Water Shield exited the roof it was dressed over a tile but hidden from view by the overlap of the next tile. Outline planning was granted over 82-88 Cumnor Hill for 6 flats and 8 large houses. Phase 1; 88 Cumnor Hill, would provide the entrance to this development by demolishing the small 3 bedroom house that existed on this steep sloping plot. The building containing the six flats would form the entrance to the overall site and therefore was given a specific design brief. 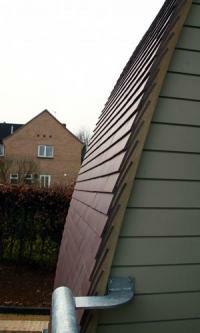 Clay tiles were not the first choice, a metal roof was chosen initially. This roof had a very shallow pitch designed to follow the natural sloping contours of the site. The architectural committee of the planning department condemned the design with the metal roof in the strongest terms. Therefore it was back to the drawing board! Subsequent changes that were made to the design were however quite minor, the internal layout stayed the same but the roof moved. The shallow curved roof on the top of the building was now slipped to each end of the building. This revised design meant that natural clay tiles were now the obvious material to use. The re-submitted design, although in essence the same building, looked very different. So much so that the same architectural panel responded by saying that although this building may seem rather radical, it is of design standard that should be much encouraged. The second floor of the building was designed to provide for full height accommodation and avoid sloping eaves. 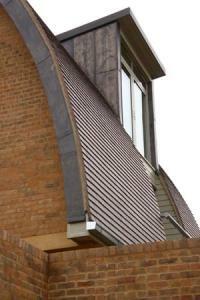 The curved roof enabled these criteria to be successfully met. It was decided to not bring the curved roof down to a level where footballs could potentially be kicked against the tiles. Because of the steep pitch over most of this roof all the tiles are twice nailed and replacing broken tiles would be a more involved task than usual. This is a design issue best observed on all vertical tiling. The tiling is of a very high standard, carried out by Rycote Developments and as Robert Gee of Rycote commented, “this project demonstrates very well the use of a traditional product in a contemporary design, producing a fantastic overall result”. Adrian James Architects were described in a recent article in the Mail on Sunday March 9, 2008 as “an award-winning contemporary architect based in ..., Oxford, with an interest in sustainable design and a reputation for steering through unusual concepts.